Marvelous Multiagers! : More on the Top? So right now in second grade, we are working on double-digit subtraction with regrouping. Honestly, this entire year in second grade math, the kids have known how to do everything already or caught on CRAZY fast. This is the first topic I've taught them where they haven't flown through it. It feels good to finally challenge their brains!! The verbage in my book to teach this fantastical topic was so dry. 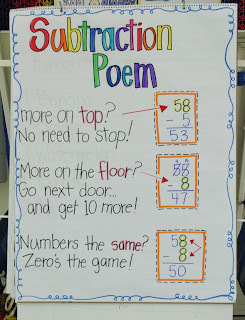 So I remembered the subtraction poem I read on The Inspired Apple and taught it to them! After I taught them how to do double-digit subtraction, I wrote a problem for each kid on the whiteboard and then they took a dry erase marker and solved it. After I checked their work, they made up their OWN problem and we did a mini Scoot game where they'd move around to solve their friend's problem! It was fun and they loved making up their own problems. That's all of them.... all 5 second graders. I'm looking forward to going back on Monday and working more on this super fun concept! They are loving the challenge so far! I am so glad you posted this poem. I sort of remembered it from earlier this year,and tried to teach my colleague, but I messed it all up. Now I'll get it right and make my own poster! Thanks! It is really such a hard concept! Scoot is such a neat game....I have never seen it before. I will have to incorporate that into my room too! Scoot is a wonderful game. My kiddos enjoy it whenever we get to play it.